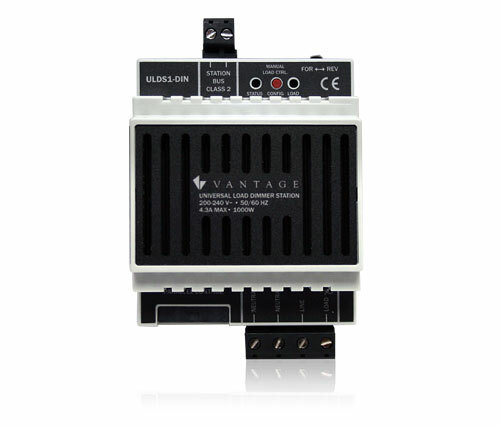 The Vantage Universal Load Dimmer Station is a high power, single channel dimmer that connects to the Control System. It is powered from a local line feed, and communicates with the system through the two wire station bus. The dimmer can be controlled by any touchscreen, keypad, IR or timed event. The ULDS1-DIN is capable of controlling forward or reverse phase loads and is designed to install easily on standard 35mm DIN rail. Two dimmers can be connected in parallel using the ULDS1-CC-DIN control cable to double the load capability.